D'Eon de Beaumont, a handsome diplomat who actually lived in 18th century, traveled around various countries under the French king's command. But his most peculiar trait was that he managed to pass himself off as a woman. The story follows "Chevalier" (="Knight" in French) D'Eon de Beaumont, a handsome intellect who actually lived in 18th century. 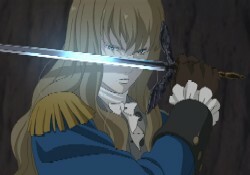 D'Eon was known as a diplomat who traveled around various countries under the French king's command. But his most peculiar trait was that he managed to pass himself off as a woman. The core of the story is based on the mysterious hero and the historical facts. Truth has been erased in the darkness of history - A great epic that far exceeds imagination is finally revealed in all its intricate detail. The story takes place in the 18th century just prior to the French Revolution. D'Eon's elder sister Lia, a retainer of Louis XV, is mysteriously murdered. D'Eon pursues the truth of his sister's death, but soon he finds out that it was not a mere murder, and the trail leads him ever deeper into an increasingly serious incident which involves the whole European continent. At the same time, several key elements such as and the whereabouts of Lia's soul deepen the enigma of the story. One mystery connects to another into a chain and leads us to historical truths that have been kept unknown and hiddden. 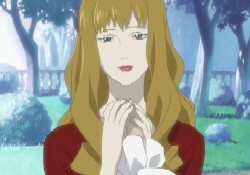 Who killed D'Eon's sister? Why was she murdered? What will D'Eon find out in the end? Tow Ubukata has taken this grandiose story and made it into a compelling and rewarding film. He won the 24th Japan Science Fiction Grand Prize in 2003 and is one of Japan's most promising up and coming writers in the genre. Ubukata is currently writing the novelization and the script for the comic version of "Le Chevalier D'Eon," but he is also actively contributing to the screenplay and the overall story plot of the animated version, and has literally created a whole new world for the TV series. World famous Production I.G is in charge of the visual images. Production I.G has the honor of being the first Japanese production company to have a No. 1 hit in the United States with "GHOST IN THE SHELL", as well as providing the animated sequences for "Kill Bill: Vol.1" directed by Quentin Tarantino. A world class staff includes director Kazuhiro Furuhashi ("Zipang", "Hunter x Hunter", "Rurouni Kenshin") and Tomomi Ozaki as lead character designer.